Made from the popular Canadian manufacturer, Arizer. The update may not seem massive, the changes made to the Solo 2 are actually pretty major and make it one of the best Arizer units yet! So let’s dive right in and see what’s new! Get your Arizer Solo II TODAY! The Arizer Air is precisely engineered with powerful and unique heating technology in a durable, ultra-compact design that is completely portable. An easily interchangeable, rechargeable, high-capacity battery provides up to one hour of continuous use per charge and gives you the option to carry spare charged batteries for extended use. Which pretty much means… on the go, unlimited vaping! Don’t let the size fool you — Small Size, Big Performance! The Arizer Solo II is one of the best portable vaporisers for dry herb on the market today. 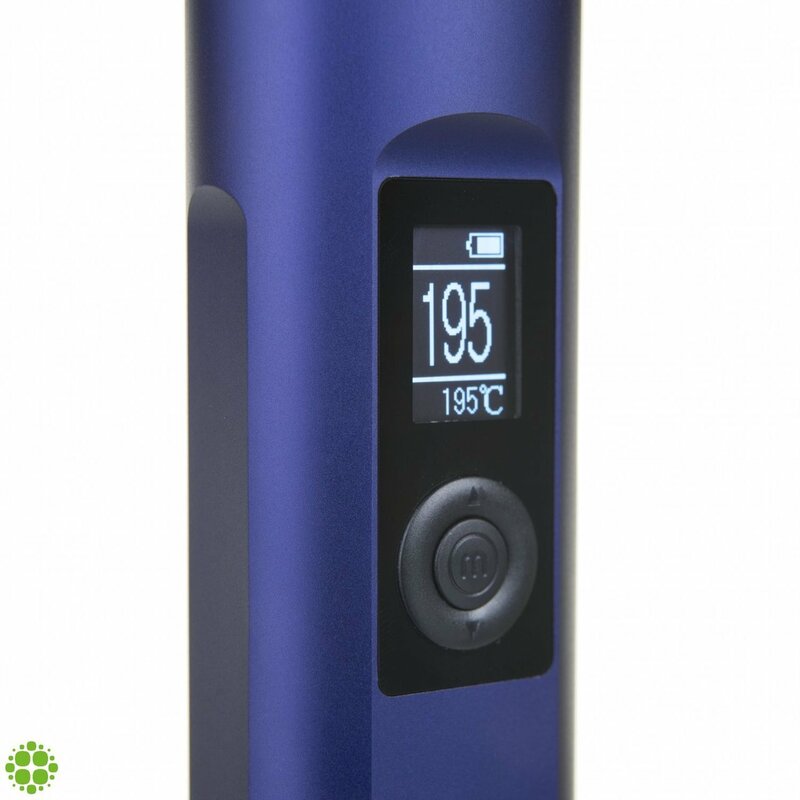 This is the second iteration of the Arizer Solo now available in Mystic Blue (and more), featuring a more powerful battery, improved airflow, a vibrant LED display, customisation settings for the best vaporisation experience, and impressively thick vapour production that hits hard. To simply turn the Solo 2 on, press and hold the menu button and the up button. Below the display is your navigation buttons, in the centre your find the button marked with a “M” as your menu button. Here you can access the settings to customise it to your needs. Above and below the menu button you will find the up and down arrow buttons, they allow you to increase and decrease the temperature, and also change the settings in the menu. Loading the Solo 2 is pretty much the same as loading any other Arizer unit. If you have never used an Arizer before, not to worry, take the glass aroma tube and fill the bottom of your dish with your chosen herbs. Next, insert the loading aroma tube into the heating chamber, now sit back and you are ready to vaporise. The first update is the user-interface on the Solo 2. The 7 temperature lights have been replaced with a bright LED display, giving it a smarter modern look. The Solo 2 introduces precise temperature control to the Arizer line of portables, which is something that was lacking for some time. Through the LED display the Solo 2 can be set anywhere between 50c – 220c. Allows you to pinpoint the optimal temperature for any dry herb strain, then uses an all-glass borosilicate vapour path to preserve the essential flavours, aromas, and benefits with zero combustion. With a travel-friendly size, Arizer Solo II is ideal for home and portable use alike. Expect Arizer Solo II to deliver thick, flavour-rich vapour clouds, a seamless user experience, and a battery life that accommodates even the busiest lifestyles. With the Solo 2 reaching the highest temperature in less than 30 seconds. Which is impressive, and means the days of waiting for your Solo to heat are gone, leaving more time to enjoy your vape sessions. The Arizer Solo 2 is no doubt a powerhouse, with upgrades from the already beloved Arizer Solo l, we all knew the Solo 2 would be a popular vaporiser people will be wanting to get there hands on. Taking a reliable model and retooling it to give it those little upgrades and push to give the vaping nation and even better tasting, vaping experience than before. The Arizer is perfect for anyone, from newbies to people who having been vaping for years, this vaporiser certainly backs up all the good comments and reviews it has received. You will NOT be disappointed. If you have any questions, or want to get in touch with us, please don’t hesitate. You can find us on our website ForbiddenFruitz, also on eBay. And don’t forget to follow/like/comment on Facebook, Twitter & Instagram.